Bridgeway uses Microsoft to manage user accounts so that we can offer a single sign-on experience to our students. This account is used for login purposes only. It is not used to access email, Office365, or any other applications other than the Bridgeway Learning Center. Your Microsoft username and password are assigned at the time of enrollment. Only students have Microsoft accounts. Parents log in with their own username and password. 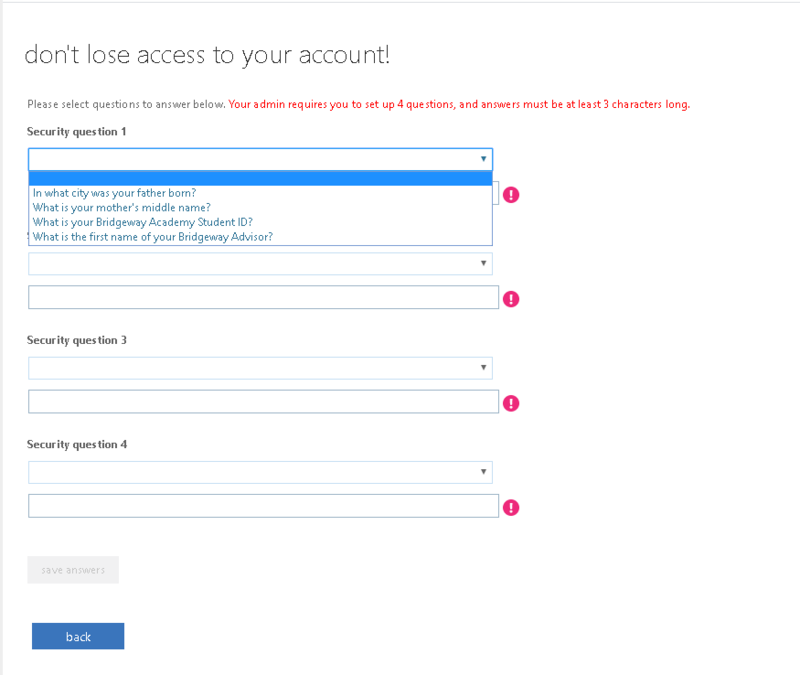 We do not collect or store anything in the Microsoft cloud other than student usernames and passwords, and answers to authentication questions. Contain one non-alpha or non-numeric symbol, such as $, #, %, etc. Answer Security Questions. The first time a student logs in with Microsoft, they are asked to register. The purpose of this registration is to allow the student to retrieve their password if they forget it. Students will need to answer 4 security questions. To reset a password, the correct answer to at least 3 questions must be entered.